you think you could go in a day? and water-pistol with recording of thunder could simulate bad weather. There are more carriage-related terms below. or other load. This word can also mean the amount of water a boat displaces. These are labeled r on the illustration above. hames- curved metal or wood-and-metal bars that encircle the collar and to which the harness is attached. 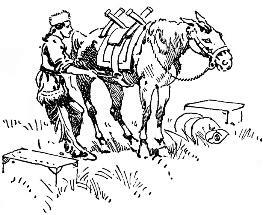 pole- the central pole that projects from the front of a carriage or cart and goes between a team of draft animals. yoke- the wooden harness that encircles the neck or horns of an ox. single-tree- a rotating metal or wooden bar on the wagon or cart to which the traces attach. double-tree- a rotating metal or wooden bar with singletrees on each end. many areas. Bicycles were not common until the 1880s. Certainly there were no airplanes. about the pros (good points) and cons (bad points). Danger from hostile people and robbers and from wild animals. No shelter while traveling. 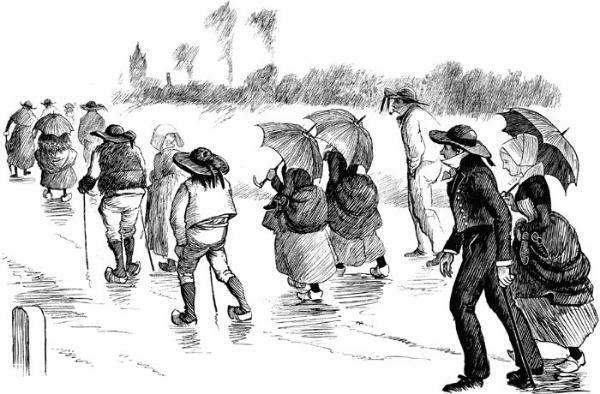 Walking is uncomfortable and even dangerous if it’s cold or rainy. You can’t carry much luggage or goods. Riding is faster than walking. You use less energy and get to your destination more quickly. You could out-run a predator. Your horse or mule could carry more goods. they don't want to work. You are still exposed to the weather. This is slow, but the horse can carry a lot of goods. 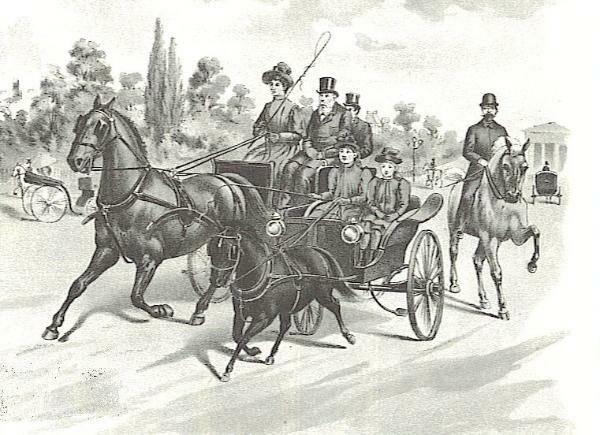 Riding in a carriage pulled by a horse or mule may be faster than walking, as long as the road is good. You can take a LOT of goods to market. If your carriage has a cover, you have some protection from rain and snow. There is still some danger from predators and bandits, but your horse might be able to out-run them. Not all roads are good enough for a wagon or carriage. You may get stuck. Mules and donkeys can be stubborn. Wagons, harness and draft animals cost money; not everyone can afford them. Very fast by 19th century standards. You can carry as much luggage as you want or can pay for. You are sheltered from the elements, although sometimes travelers have problems from the soot. Trains don’t go to every town. 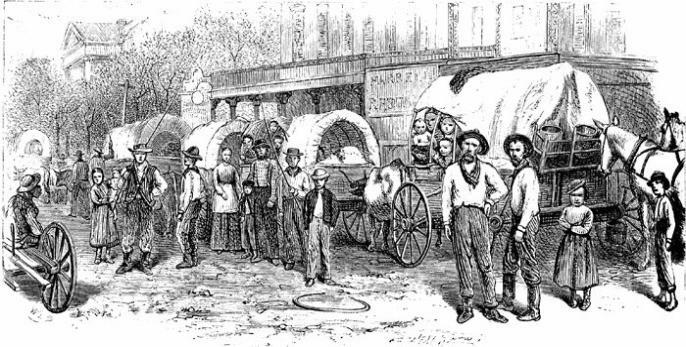 You may still have to hire a wagon or horse or walk the rest of the way. You are in danger from train wrecks and the occasional robbery. The bicycle was a late-19th century means of travel, but it became very popular. They might break down but they did not get sick. Bicycles were good on hard-surfaced roads, but were not as good on rough terrain. forge a path through the brush. 6) Travel in a canoe, piroque (pee'-row) or canoe. Canoes are relatively inexpensive to buy or you can build certain types by yourself. They don't require extra food or fuel. You can travel quickly downstream, but it's much slower going upstream. A canoe can be very dangerous in rapids. There is also possibly danger from alligators in some areas. Some canoes are small, and you could not carry much luggage. No protection from the weather. Obviously, you would have to walk to any in-land destination. Like the canoe, it's easy going downstream, but more difficult going upstream. You can carry lots of luggage AND even your animals on a large flatboat. You may have a tent or even a little house on your boat to protect you from the elements. There is danger from whirlpools, rapids and floating logs. from the raft when you arrive at your destination. is given credit for inventing the first commercial steamboat, the Clarmont, in 1807. He also invented a type of submarine. Like trains, steamboats are fast, relatively speaking. There’s no work involved if you’re paying for a ticket. You can carry lots of luggage or merchandise. You’re sheltered. The travel is even luxurious on the larger boats. heated boiler, made steamboats "floating tinderboxes." is sometimes called a whip. 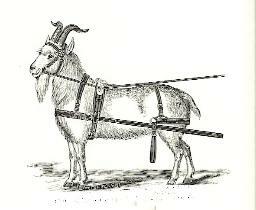 A goat in harness ready to pull a cart. 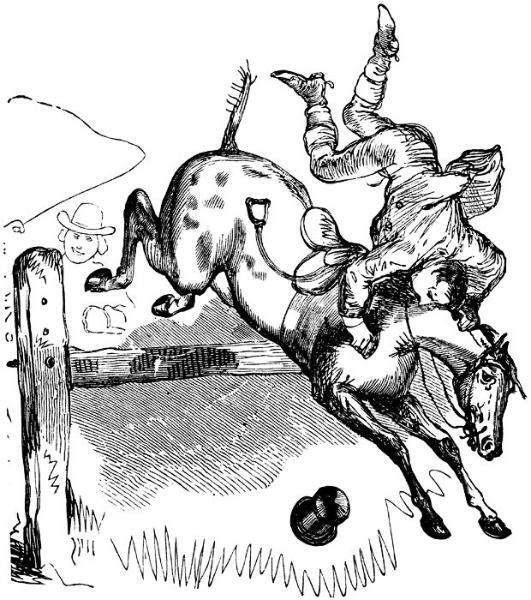 “went by Shank’s Mare” or “rode Shank’s Mare.” A mare is a female horse. Here is a steamboat on the Mississippi River. Can you find the Mississippi River on a map? the age of the students. with the man tightening the pack-saddle girth!